The Department of Molecular Biology is the core of the life sciences at Princeton. 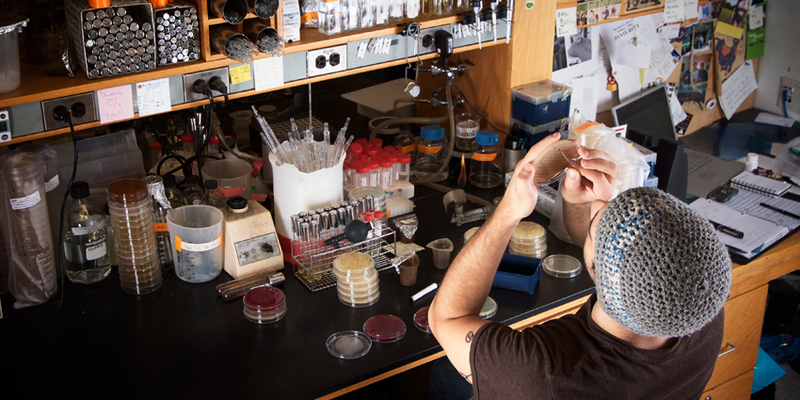 We are a world-class faculty with diverse research interests spanning molecular, cell, and systems biology, and we study organisms ranging from viruses, bacteria and yeast to worms, flies, fish, mice, and humans. Many of our faculty have joint appointments in the Departments of Chemistry, Ecology and Evolutionary Biology, Engineering, Physics, and the Lewis Sigler Institute for Integrative Genomics or the Princeton Neuroscience Institute. All of us, as well as faculty from these sister departments and institutes, participate in our undergraduate and graduate programs. The uncommon level of inter-disciplinary interactions provides an exceptional environment for learning and research. Members of the Department have expertise in genomics, proteomics, cancer biology, developmental biology, neurobiology, and microbiology, for example. We have programs in global health, molecular biology, neuroscience, and quantitative biology. Faculty members have won numerous prestigious awards (including the Nobel Prize and the Macarthur Genius award), and at least 10 are members of the National Academy of Sciences and the American Academy of Arts and Sciences. Many faculty lead their disciplines by serving as presidents or officers of societies. They serve on journal editorial boards, NIH study sections, scientific advisory boards, and boards of foundations and companies. For more information about the department, please refer to the Chair’s Welcome. Grimes DT, Burdine RD. Left-Right Patterning: Breaking Symmetry to Asymmetric Morphogenesis. Trends Genet. 2017 ;. Grimes DT, Boswell CW, Morante NFC, Henkelman RM, Burdine RD, Ciruna B. Zebrafish models of idiopathic scoliosis link cerebrospinal fluid flow defects to spine curvature. Science. 2016 ;352(6291):1341-4.